Our own Adam Platt filed a twofer this week and wrote about the return of lobster thermidor at Le Philosophe, as well as Laurent Tourondel’s beef-heavy menu at Arlington Club. He gave two stars to the former and one to the latter. 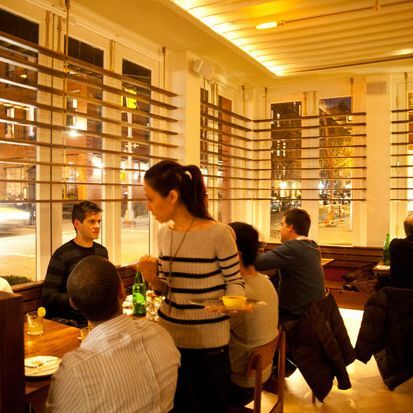 Where did the other critics dine this week? Read on to find out. Pete Wells visited Gabriel Stulman’s Chez Sardine in the West Village and deemed it a marriage between “Asian stoner food” and “fat-on-fat cuisine.” He was impressed with unusual combinations, especially the eel and braised pork belly hand roll, breakfast pancakes with salmon roe, and the miso-maple salmon head. But dishes like the Japanese brown curry and raw seafood with fried rice balls weren’t as successful, and left him wishing for a little restraint from the kitchen. One star. Michael Kaminer reviewed Murray’s Cheese Bar. He found small, cheesy appetizers like fried Wisconsin cheddar cheese curds memorable, and called Murray’s cheeseburger “a thing of beauty.” Though the macaroni and cheese was shallow and soupy, dessert was a hit. Grilled bread cheese served with dulce de leche is a “sweet-savory riot,” and chocolate and Cheese (with Mast Brothers chocolate and milky Barilotto di Bufala) “poetry.” Kaminer thinks this offshoot just needs time to ripen. Ryan Sutton spent time at Gaonnuri and found it to be “one of New York’s weirdest and most expensive places to eat Korean.” It’s overpriced for what the restaurant offers, Sutton suggests: $59 for soup, $120 for barbecue platters, and $15 for rubbery calamari. But the short-rib sandwich with sautéed kimchee has a nice balance between sweet and salty, and an octopus bokkeum stew can easily feed three. Tableside barbecue, though “aggressively priced,” is executed quite well. One star. Scandinavian darling Aska got one more review from Jay Cheshes. He found that even snacks at the bar show the kitchen’s self confidence: “Potato-pork dumplings are almost supernaturally fluffy.” Cheshes thinks the infamous pork-blood chip is “intense enough to awaken the palate.” Poached oysters in a cucumber broth were “offbeat and delicious,” and he complimented most of the “daredevil dishes.” He recommends the bay scallop with scallop leather, pig’s trotter with sunchoke, and hay-roasted beet. Four stars. Steve Cuozzo headed to Brooklyn to review Italian restaurant Red Gravy, where he found its meatballs to trump those in Manhattan. Though the signature red gravy is only offered on Sundays, Cuozzo advised going there specifically for the thick tomato sauce served with pasta, lamb ribs, pork sausage, short rib braciole, and one “glorious” meatball. Two and a half stars. Robert Sietsema traveled to two Brooklyn ramen joints, Suzume and Ganso. The former offers offbeat options like “spicy butter tofu ramen” and roasted salmon ramen, both of which Sietsema believes to succeed quite well. Suzume also has a sushi menu, which is made up of all locavoric fish. Even better are the scallops topped with red roe and spicy mayo, which he found irresistible. Further into Brooklyn, Sietsema deems Ganso “quite simply one of the best ramen parlors in town.” Its broth is not fussy, and the house special ramen has intricate layers of soy broth, pork shoulder and belly, “gooey egg,” and bitter greens. Small appetizers like gyoza, baby-back ribs with miso, and pork belly buns are also worth ordering.